It can be correctly argued that FC has been fully debunked starting in the early 1990s and with over 50 more studies since which clearly and irrefutably shown many, and in some cases all, of the messages are actually written by the facilitator. The scare research validating it is deeply flawed. It can also be correctly argued that FC is dangerous with false allegations of abuse sending families using FC into a tailspin with the legal system and, occasionally, leading to other facilitators feeling it is appropriate to accept consent for sexual activities from communications that facilitator is "facilitating". It should also be noted with abuse rates of those with complex disabilities up into the high nineties any practice which trains, expects or insists that a person with a disability allow another person to manipulate/touch their body, especially without their consent, is problematic and may be part of grooming these individuals to be abused. Many proponents of FC argue that some FC users become independent. This is true, in a few notable cases, but there is no evidence these individuals would not have learned literacy and to communicate through other methods. Nor is there evidence that even a small percentage can of FC users find similar success. Without such success FC creates a very small world for the the vast majority of people using FC to communicate. A world limited by their access to a facilitator where every word will be doubted because of the methodology being used. This is a shame since we have so many other wonderful, valid and independent ways for those who need alternative ways of communication to create and share authentic messages. It is also a shame since individuals who could be communicating freely are held hostage to the system of FC unless they are one of the few who becomes autonomous. Another important point, as educators, therapists, and doctors and is that FC does not align with best practices in communication, literacy, occupational therapy or education. No typical child would be taught to read by being physically made to touch letters on a board. No typical child would be expected to master language by being assisted to touch letters to spell without modeling of langauge or ongoing exposure to others using this method. No typical child would be expected to accept someone near them and touching them, nearly all the time. Why is it ok for children who cannot speak? It isn't. FC is a highly problematic, debunked and unethical means of offering communication to someone who doesn't speak. We must demand all individuals with complex communication needs be given robust AAC systems without prerequisites, be exposed to thousands of hours of aided language input, be taught to read and write using the latest research in literacy instruction and be included in their communities. We must, at the same time, stand up to the resurgence of FC, and its cousin RPM. We must stand up despite the bullying and harassment FC supporters dump on those who stand for truly presuming competence and potential. For over ten years I have written this blog and never have I taken a public stand on this, fearfully of the harassment and accusations and believing ultimately science and respect would win out. Now I take a stand and I ask you to sigh this petition to ask New England College to cancel the FC training on their Concord Campus and ask MGH and its Lurie Center to stop promoting this dangerous and unethical practice. How can you take a stand? People who know me know that I talk about the AAC or Communication Bill of Rights all the time. All. The. Time. I talk about it when training teachers, parents/caregivers, therapists and paraprofessionals. 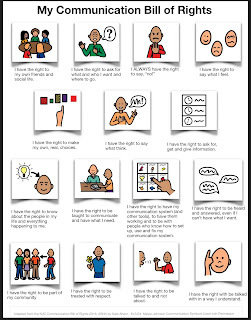 I teach directly about the AAC Bill of a Rights with my AAC using students. I program specific messages about the AAC Bill of Rights onto my clients’ AAC Systems so they can self-advocate quickly when needed. I talk about it when I teach about AAC and behavior because often times “challenging behavior” is an indicator that the AAC Bill of a Rights is not being respected. Years ago, I revised the AAC Bill of Rights into various common symbol sets used in the USA and colleagues followed suits in their own countries. There are currently two versions of the full text of the Communication Bill of Rights available, the 1992 version and the 2016 version. Both have the basic and vital information. I adore them both. They frame all I do in my work with individuals with complex communication needs. I honor and respect those that created both versions. Their work was and is visionary and incredibly impactful. However, the truth is, both versions of the Communication Bill of Rights are largely inaccessible to lower level readers and some individuals with intellectual or cognitive disabilities. To some degree, both Bill of Rights, though especially the 2016 version, are inaccessible to the average American, and since it is reported that the average American reads at a grade 8-9 Level. In fact, 1 in 5 Americans is reported to read at a fifth grade level and below. This means that some caregivers, some direct care workers, some friends and family and some AAC users are not able to access the incredibly important ideas in the Communication Bill of Rights. Those who use AAC need all of those people to be able to read and understand their rights. The Communication Bill of Rights are also (both versions) inaccessible to same age peers in our elementary and middle school classrooms, peers who could can play a dramatic role in the lives of their friends who use AAC. To be fair, the Communication Bill of Rights wasn’t created for caregivers or direct care workers or children or AAC users. The updated version included information on how practitioners, specifically practitioners, could use the document to advocate for communication supports and services, promote inclusion and encourage broader community acceptance. Clearly the intended audience was practitioners. I can’t think of a better way for this practitioner to advocate for communication supports and services, promote inclusion and encourage broader community acceptance than to work towards a more accessible version of the Communication Bill of Rights. So let’s do it. Let’s make a clear and meaningful Communication Bill of Rights, an Accessible Communication Bill of Rights. One that can be read by the average American, by the 1 in 5 Americans that read at or below a fifth grade level, by students from grade three and up. Let’s add symbols to support understanding for those who need them. After all, it is October, AAC Awareness Month! What better way to create awareness than to make the Communication Bill of Rights more understandable to more people? 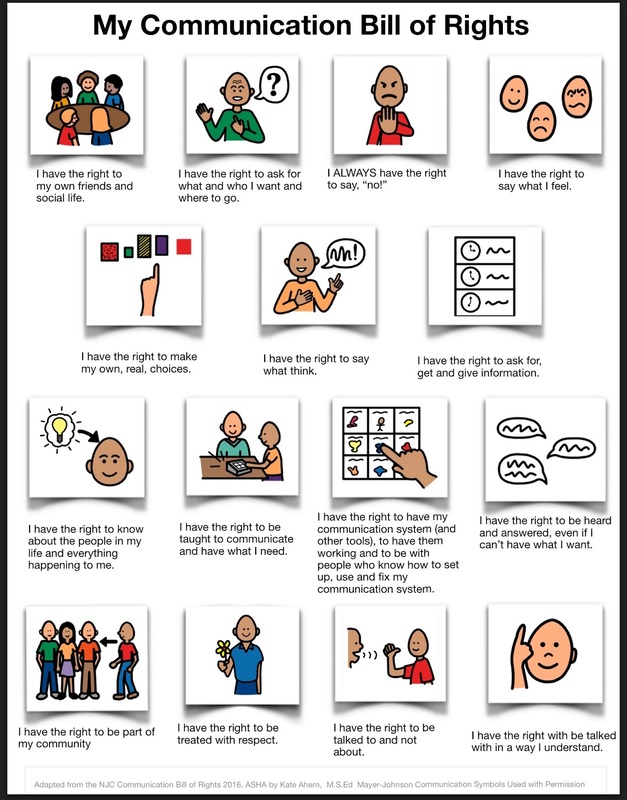 The following Accessible Communication Bill of Rights measures at a 3rd Grade Flesch-Kincaid Reading Level. 1. I have the right to my own friends and social life. 2. I have the right to ask for what I want, who I want or where I want to go. 3. I ALWAYS have the right to say, “no”! 4. I have the right to say what I feel. 5. I have the right to make my own, real, choices. 6. I have the right to say what I think, how I want to say it. 7. I have the right to ask for, get and give information about myself, my life, my schedule or anything that changes. 8. I have the right to know about the people in my life and everything happening to me. 9. I have the right to have EVERYTHING I need to be able to communicate and to be taught how to communicate. 10. I have the right to be heard and answered, even if I can’t have what I want. 11. I have the right to have my communication system (and other tools), to have them working and to be with people who know how to set up, use and fix my communication system. 12. I have the right to be part of my community, in the way that works best for me, and for my communication to be as important as everyone else’s. 13. I have the right to be treated with respect. 14. I have the right to be talked with and not about. 15. I have the right to be talked with in a way I understand. Note: I reworded each of the 15 points myself, attempting to use clear, simple and understandable language. I revised the sentence lengths numerous times as they impact readability, but many of the rights have multiple important points. I used the website Rewordify to check for difficult to understand words and phrases and remove them from the text. If you wish to test the original text of the Communication Bill of Rights Rewordify is a way to locate the difficult words and phrases, make vocabulary lists to pre-teach and make other modifications. The world of assistive technology has come a long way since this blog started! More and more often our students have the option for direct selection, the fastest way, on a communication system. For many users options such as integrated conductive touch screens, head trackers, adapted joysticks and trackballs, and especially eye gaze tracking, have made switches less necessary in our field. 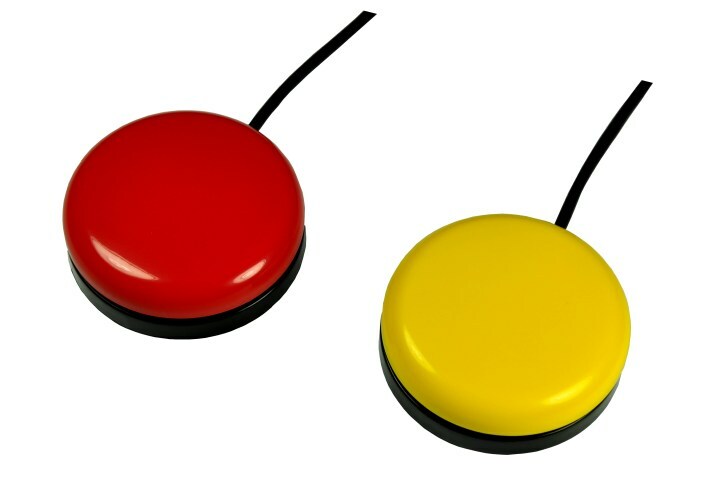 Still, switches have a place in our assistive technology tool kit. For learners with access needs that preclude direct selection through any possible means our next option is usually switch access. We tend to start with a single switch for cause and effect, yet few of our learners really need to learn cause and effect. If the child drops something, catches her head under her headrest, or does anything else for the entertainment of it or to seek attention the she already understands cause and effect. 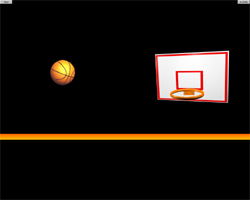 A few runs using a switch to turn on preferred music or a fun toy and you are ready to move on to other switch purposes. At this point it is vital to begin with the end in mind. What will the child ultimately use switches for? If it is for communication, the most important thing we teach, then forego any extraneous steps when you look at a switch progression or heirarchy of skills. Your student doesn't need to learn to press and hold or turn on and turn off if ultimately you are seeking the student pressing and releasing a switch as part of a switch scan. Don't let these extra skills slow down communication access! You can develop them later, or program the communication system to eliminate their need. of or having a special activity, purpose, or task; relating to the way in which something works or operates. "there are important functional differences between left and right brain"
(of a disease) affecting the operation, rather than the structure, of an organ. (of a mental illness) having no discernible organic cause. designed to be practical and useful, rather than attractive. "she had assumed the apartment would be functional and simple"
"the museum will be fully functional from the opening of the festival"
"the machine is now fully functional"
In this definition, the part that applies to functional skills for our learners is "2. designed to be practical or useful." Functional skills should be practical and useful. They should be skills our students will use over the course of their education and their lives. Often times these functional skills are futher broken down into activities of daily living/domestic skills, social skills, community skills, and self-determination. Perhaps the best reference for functional skills I've ever used is the Syracuse Community Reference Curriculum. If you are looking for a good source for functional curriculum is is one place to turn. Yet, it should never replace access to the general education curriculum. Ironically, self-determination is often under emphasized in some functional skills curriculums. Some such curriculums actually teach students skills that increase their likelihood to be abused or mistreated in addition to ignoring self-determination, for exaple curriculums that teach "accepting no" or "tolerating distress". If a functional skills increases the likelihood of abuse or even just unhappiness as an adult it isn't actually functional. When we are working with children who have developmental or intellectual disabilities but no additional physical or sensory needs it is easier to assess that child and design an educational program to teach skills which are practical and useful in addition to the general education curriculum. This become more challenging when we are working with children with complex physical and/or sensory needs and/or complex communication needs. Those children are much more difficult to assess and it is easy to fall into the trap of believing that just because a child cannot be assessed they are not capable of learning and progressing in the general education curriculum. Over and over we hear stories these days of such children being underestimated and denied an education. We need to ask ourselves, "if this student writes a book someday, what chapter do I want to be in?" These students with complex bodies and communication needs may still need to be taught some practical and useful skills. However, parts of the curriculum typically considered practical and useful/functional, such as hand washing, setting a table, or dressing cease to be practical and useful for some of these students. Especially if our first response to physical and sensory challenges is turning to hand over hand methodology. This is because some of our most complex students cannot physically do these tasks independently and we don't think about changing the activity instead of stepping in and forcing the child to participate physically. It is, of course vital that these students be able to participate as fully as possible in these activities or alternatives to these activities. A student who cannot wash his own hands need to be able to know when to ask to have his hands washed, ask to have his hands washed and participate as much as is needed. He also needs to know to be sure those who care for him wash their hands and be able to request they do so. A student who cannot physically set a table still needs to understand a table setting and know how to ask for table items they might need. A child who cannot physically dress herself needs to be able to notice when she needs to change her clothes, choose clothes, and direct someone to find her clothes and assist her in dressing. We need to analyze what would make each activity practical and useful for the child and then teach those skills. However, none of these practical and useful skills and adaptations eliminates the needs for access to the general curriculum. 1) Are we teaching "functional skills" because we have never considered teaching the general education curriculum to this student? For 99% of children in our schools the general education is functional. Learning to read, write, do mathematics, learn from what we read and understand our history, society and world around us is functional. These skills will allow typical children to understand and participate in their own lives. Learning these skills is also functional for our learners with very significant disabilities. The importance of what is taught doesn't disappear because our learners have complex needs. Learning about Einstein means the child, typical or disabled, has a shared understanding of a scientist and political figure. It means a child can understand a reference to Einstein such as, "It doesn't take an Einstein." Learning the general education curriculum gives the child a schema to understanding. In terms of neurology learning complex ideas such as those found in the general education curriculum create news neuropathways which can then be reused and strengthened. It gives the child a social currency that matches typical peers. Have we really considered teaching general education content to our kids? This is an area where those of us in the field of education for children with severe or multiple disabilities should take our cues from teachers of the blind and visually impaired. Such teachers do not see a functional skills curriculum as a replacement for an academic curriculum, they see it as an extension of the general educational curriculum. They call this the Expanded Core Curriculum. 2) Are we teaching literacy, the ultimate "functional skill"? We use literacy skills all day everyday. We wake up, check our phones for texts and the news - reading those things. We read the buttons on the remote, the coffee maker and go through our morning routines. We write a note to partner or child. We read the messages on signs on the way to work. Not just the road signs, but all the signs. Here in Massachusetts the latest LED road sign messages have been "Use your blinkah!" Even if you aren't the driver that's fun. Maybe you see a sign for sale on something you love, or a potluck dinner or an upcoming civil event - my town just had a Yankee Doodle Parade. How can our kids beg mom to go to the parade if they can't read the sign about it? Once we get to work we might read a bulletin board. We might check our email. And we aren't even at 9 am yet! Nothing is more functional, nothing is more of a life skill, than literacy. By this I do not mean community signs and environmental print. That isn't literacy. Literacy is the ability to encode and decode words. If you can encode and decode words you can read community signs and environmental print, these skills are gained through literacy. Literacy is also a civil rights issue. It always has been. One of the ways one group of people exerts oppressive power on another group is to bar the teaching of literacy. In the case of our students it is more a lack of expectation for our students, a lack of knowledge on now to do it and, to some degree, neglect. I was tempted to say benign neglect, but it isn't benign. It is malignant to not be taught literacy. It is disenfranchising. If all children except those with disabilities are taught how to read that is discrimination. Maybe some of our kids will age out of school at 21 and they won't know how to read, but it should never be because we didn't try teach them every single day they were at school! 4) Is this student capable of physically doing this "functional" task independently? If not, is working on an unattainable skill the best use of the time this student should be spending time learning? Is it practical and useful for the child to spend time working on something they will not physically accomplish? For example, if you have a student who is physically not able to hang up her coat because of her physical challenges should a portion of each day be spend forcing the child to hang up her coat via hand over hand methodologies. Would her time be better spent working on some of the other skills that are typically being used during arrival or coming in from recess? Perhaps she could be focusing on socializing with peers during the transition. Perhaps her time would be better spent learning to direct someone else to hang her coat and put away her bag or take out her notebook. 5) How does this functional activity teach communication skills? Communication is the most vital skill we teach to children with multiple disabilities and complex communication needs. It is possible to incorporate true, child generated communication into every single activity we do in schools, from functional skills to the general education curriculum. True, child generated communication is not activating a voice output switch with a pre-recorded message that the child had no part in creating. A fact of communication is that your partner doesn't know what you are going to say! Switches can't do this, in fact sometimes when we use voice output switches it is sometimes the child who doesn't know what she is going to say! That is so backwards! Every student should have access to a robust communication system. Communication partners should be using those systems to speak to the child every time they speak to the child. We should be targeting vocabulary and communication skills at one step beyond what the child can currently do. Making every activity a communication activity is a quick way to make a curriculum functional. This past week in the Facebook group AAC through Motivate, Model, Move Out of the Way we held a challenge for folks to post one picture each day of AAC users with their AAC systems "in the wild" (in everyday use, preferably out in the world). It was an overwhelming success with hundreds and hundreds of pictures posted from around the world! Posts included some in Dutch, Norwegian, French and Spanish as well as English! The above video is the "long cut" and this is the "short cut". You can see pictures from the campaign by searching for #seemeseemyaac on Facebook and other social media platforms. The campaign was such a success that another challenge is being planned for July! Meanwhile, #seemeseemyaac is an ongoing event! Post pictures of your AAC users "in the wild" and add the #seemeseemyaac and join in the fun and inspiration! Just Talking To Myself, Don't Mind Me. But what happens to our student who do no have the language skills for an internal dialog or who use AAC to communicate but have not developed the skills to use language for self-talk? Especially if those students have issues with anxiety, regulating their emotions, self-soothing or executive functions? All too often what happens is we do not realize that part of their struggles are because they do not have the ability to hold internal dialogues and we turn towards behavioral interventions that might help in the short term but do not develop the vital skill of self-talk. We stop the problem in the moment (maybe) but don't stop future problems. But do we focus on the fifth, and just as vital function added by Buekleman and Miranda? Internal dialogue (aka self-talk)? Focusing on internal dialogue and teaching it with as much attention as we teach the other four functions is vital for AAC users. I always think about my verbal students who had Down Syndrome as my models for what self-talk looks like. regulation. When he was working at his desk he would stop and look around and then say aloud, but to himself, "back to work, Cor!" Or if he was in the hall and started to run he would say, "walk in the hall, Cor" and return to walking. He used self-talk for other things too. When he was very angry at me for insisting on things like doing work or follow rules he might say, "the Power Rangers are going to get her". Which was fair warning that he was upset and I should back off but wasn't meant for me, it was meant for himself, his internal dialogue was specific to his needs, if the Power Rangers were going to get me he was free to calm down. By the time he was 14 he didn't need to rely on the Power Rangers as often and could use other self talk like, "you can do this, Cor" or "I'm the man!" Cory had developed the vital skills of internal dialogue. But how do we do that for children and others who use AAC and have complex communication needs? auxiliary words (fringe) and stored, quick phrases and sentences for times that often repeat or do not allow enough time to make a message. Basically, a robust communication system. We use aided language input/modeling to connect what we want to teach to what is happening in a natural setting and we do so intensively over long periods of time. We use structured lessons, games and activities with adapted materials for direct instruction. We provide visual supports. We use video modeling, including contextual video modeling, self video modeling and modeling by highly preferred people or even puppets as appropriate for our learner. At first self talk will likely be pre-programmed phrases for our complex communicators, especially those with intellectual or developmental disabilities as part of the complexities. Though some may be able to create self-talk messages in the moment, possibly with coaching. Observe your student closely and connect with parents and other stakeholders to determine situations when self-talk might be useful to the child. Does she have trouble at transitions? Does he get anxious when other people are too close? Knowing which situations might be relieved by the ability to self-talk while help you choose the messages needed. Consider if there is anything that is said that calms or assists the child during these times. Do you repeat, "you're ok" or "safe body"? If so, these phrases will be useful to turn into positive, self-talk statements on the child's AAC system. Watch the child and look for the cues and body language you can teach him to recognize in himself for when he needs to use self-talk. Take note of these for later. Seek the input of the child! This is vital! When he or she is calm and focused talk about what sorts of messages he or she wants to talk to himself. Offer choices based on reactions to the conversation. Allow them to select from different phrasing of the same messages when it is time to program, for example, "Do you want it to say, 'I can have a safe body', 'Look at my safe body', 'I am calm and safe' or something else? The more input you have and take into account the more successful the self-talk message may be. Consider how immediate the needs will be for these messages. Then decide, with the child, how and where to put them in the AAC system. A child who is reminding herself to have a safe body may not be able to combine words to make a sentence or to navigate multiple levels of a communicate system to get to her self-talk messages. Some children may need, at least at first, to have some of the valuable real estate of the home/main/top page be taken up with self-talk messages. Other children may be ok with getting to quick phrases/quick fire or social pragmatic pages to use these messages. You might need to use some trial and error to decide where the messages go and how to set them up. Remember teaching self-talk doesn't eliminate the need for other interventions should challenging behaviors be problematic. It is another tool in the tool box, and likely a longer term intervention. Ask explained above, use all of the teaching tools you use for teaching each of the communicative functions. Model self-talk verbally and using the child's communication system both in reference to yourself and the child - combine it with modeling self-advocacy if needed For example if you spill something you might verbally say, "it makes me upset that I spilled that. But I can stay calm. I am ok." While modeling self-talk buttons that say "I can stay calm" and "I am ok" Or you notice your student is starting to get agitated. So you verbally say, "I see you making fist and bouncing in your chair. You can tell yourself, 'I am ok' and the you can say, "I need a break". Create social stories for situations that cause anxiety, dysregulation, etc which include the same self-talk messages that are in the child's talker. Some self-talk messages I have created social stories for in the past include, "I can wait", "I can have safe hands", "I can calm down", "I am ok when other people are upset". Read these frequently, especial during calmer times. Refer to the story as needed. If possible have the stories in a format the child can access independently, such as in the Pictello app on their leisure iPad or on their high tech eye gaze device. Continue to refine the messages and re-teach them as needed. Celebrate with gusto when your child uses these messages for self-talk. Use descriptive feedback while praising the child, "I heard your tell your self, 'I can wait' and then you waited! Fantastic! Here is a big hug!" Once the child has used internal dialogue to attempt to regulate they need a way to self advocate. Advocacy messages can be a bit deeper in the book or device as the hope is they are used once calm. These are messages directed towards others not the self. Hopefully, caregivers were listening when then internal dialogue messages were used and is ready to help guide the self-advocacy process. I can hear the lights/fans/buzzing/beeping. who knows what self-talk can lead to once we teach it?